PHOENIX – Phoenix lags behind its peers when it comes to competing in the global marketplace– both in exporting goods to other countries and attracting foreign companies here. But Phoenix officials said they’re on their way to putting the nation’s sixth-largest city on the map as a global business hotspot. The city has launched an initiative to help businesses here reach across borders. It has opened a Mexico City office. And it’s trying to form more relationships with Canada as well. Foreign-owned firms employ about 5 percent of private-sector workers nationwide. And in Phoenix, foreign companies employ 3.7 percent, according to global cities initiative project by the Brookings Institution and JPMorgan Chase & Co. in 2011. This puts Phoenix 75th among other cities in total private employment in foreign-owned establishments. And exports haven’t fared much better. The metro area is only the 27th largest export market in the country, according to the U.S. Department of Commerce. Marshall said standing out to foreign investors is difficult. For a long time, Marshall said Phoenix waited for things to happen. The city did not promote itself outside of the U.S. or work with other organizations to maximize its reach. 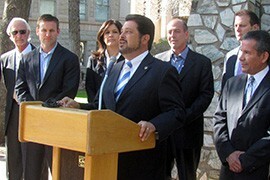 Marshall said the city also didn’t connect well with foreign-owned businesses that already had a presence in Phoenix. But Phoenix officials said it’s time to change. With the U.S. dollar standing strong, Marshall said more Arizona companies could bring foreign investment opportunities to Phoenix through trade. The theory is that with a strong dollar, money goes further and Phoenix companies will purchase imports from overseas. Once foreign companies see a large demand coming from the region, the company might set up shop in Arizona to supply the demand. Phoenix could then essentially serve as a hub and distribute to southwest customers as well as those in the Americas because of the close proximity. “Our play is not a single point of opportunity, but one that provides the investing company a myriad of outlets,” Marshall said. In October, officials opened a trade office in Mexico City with partners from the city, Arizona Commerce Authority and the state. Mexico is a growing world market and in 2013, trade generated between Arizona and Mexico exceeded $14 billion, according to the Arizona Commerce Authority. In November, Phoenix City Council approved a one-year membership with the Canada Arizona Business Council, a non-profit promoting trade and funding between Canada and Arizona. Officials said they hope the exposure will help tap into Canadian funding for projects, like expanding transportation. It’s a win-win partnership that could help Phoenix grow as a city, but it also help create long-lasting opportunities to continue making money for investors, Marshall said. In December, the city launched an export readiness initiative to educate and assist businesses that want to participate in the global marketplace. It will hold boot camps to answer legal questions, review regulatory requirements and explore financing issues. In February, VerdeXchange held a three-day conference in the Valley to explore solutions for sustainable economic growth in Arizona. And on Monday, several Arizona representatives headed to the Select USA Investment Summit in Washington, D.C., where more than 500 global companies explored investing in U.S. cities. Marshall said he had meetings scheduled with half a dozen CEOs from foreign owned establishments to discuss business opportunities in Phoenix. The Greater Phoenix Chamber of Commerce, which works with Phoenix to support local businesses, also plans to add two positions responsible for reaching out to existing foreign-owned companies and helping to push expansion, supply more jobs and provide additional services to help businesses succeed. Marshall said he hopes foreign direct investment will grow annually by 60 percent in employment and 30 to 40 percent in new foreign owned establishments. Arizona is one of the fastest-growing job markets in the country, and and now it's trying to get foreign businesses to establish presences here. Those promoting the state say it's an attractive place to do business. 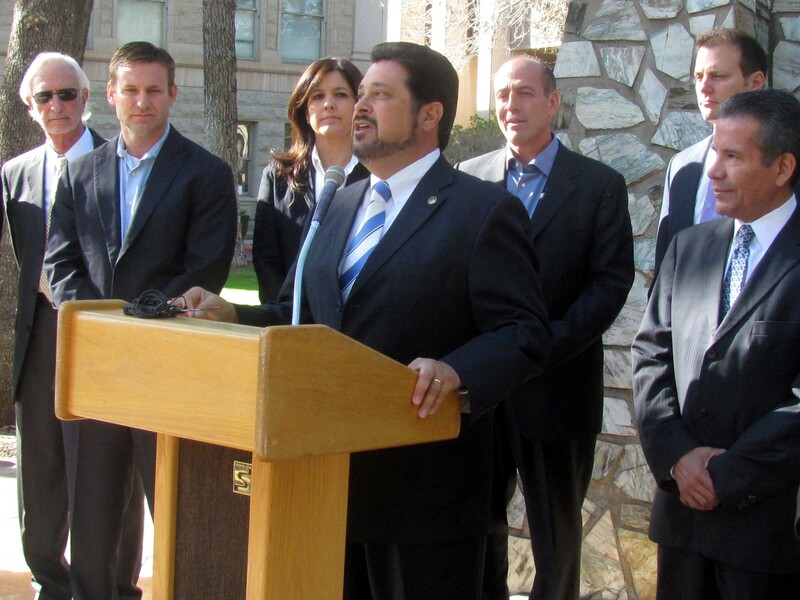 Phoenix City Councilman Michael Nowakowski addresses a news conference at which state lawmakers and city leaders outlined plans for a trade office in Mexico City.